Each time we drop the camera array at a site attached to the aluminum case is a little device called a Temperature Depth Recorder or a TDR. It measures exactly that. As the camera array sinks to the bottom it records the temperature and depth. When the camera array is brought back on board the ship one of the scientists unclip it and bring it into the lab. To get the information off you hit it once with a magnet that communicates with the chip inside telling it you want to download the information. Then the scientist places a stylus on the device and it downloads the information to the computer. The data is saved under the name of the site and then the information is entered into a spreadsheet that converts the information to the psi to meters. To clear the TDR you hit it four times with the magnet and when it flashes red it is clear! This is a picture of Kevin explaining to Anne Marie and I how to work the TDR. At every site a CTD is also dropped into the water. 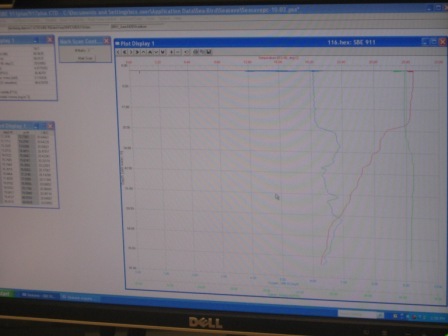 A CTD (Conductivity Temperature Recorder) gives a hydrographic (use your Greek roots) profile of the water column. 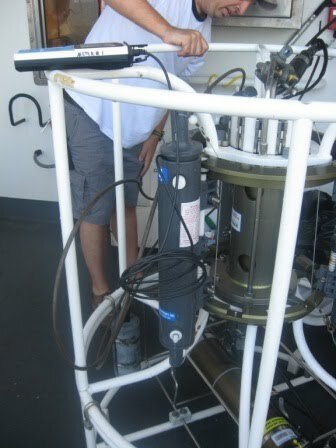 The CTD is attached to the bottom of a rosette or carousel that also contains water sampling bottles. Attached to the rosette is also a conductive wire that sends information to the lab. Mike, the survey technician, comes into the lab after every camera array is dropped and runs the CTD process. The CTD is placed in the water and allowed to acclimate for 3 minutes before they begin taking readings. The CTD is dropped to the bottom of the seafloor and Mike monitors from the dry lab. Also, once a week Mike also uses the water bottles. To take a sample they use a remote from inside the dry lab to trigger the bottles to close them. The thing that kept sticking in my mind is that at one point all of this was done by hand, someone had to do the math and all of these tests! In the morning Kevin goes through the video footage from the previous day and for each site he identifies what is on the bottom of the seafloor “sandy flat bottom”, “rock shelf” and then he identifies briefly any fish that he sees. When he is doing this process being in the lab is necessary because he will call us over anytime he sees a neat fish and explain how he can tell what the species is. Today, we dropped the camera array in 8 different sites within Bright Bank sites. The two chevron fish traps brought up a whole lot of nothing. On the bandit reel we caught one fish. It was a sand tile fish (Malacanthus pulmieri). Anne-Marie weighed and measured him and then we threw him back. I was really proud of her because she doesn’t really like fish, but she put gloves on and did everything! Today was a little frustrating it even got Kevin a little down. Kevin calls living on board being “lovingly incarcerated” beacuse you are stuck here but you are well taken care of. For instance, Ohhh, the food! The Chief Steward, Jessie Stiggins is keeping us well fed. Every morning the meals are posted in the mess for everyone to see. 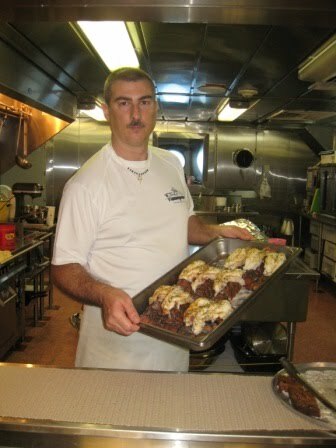 We learned from Captain Jerry that food on the ship is very important and is actually a part of the contract. In the contract it states that lunch and dinner must include a prepared dessert. “Plain cake shall not constitute a prepared dessert but a cake with icing shall.” We have had dessert with every meal! Some of the desserts are Coconut Crème Pie, French Silk Pie, White cake with fluffy whip-cream frosting and strawberries, cookies, and pecan pie to name a few. Plus there is a freezer full of ice cream which oddly enough I haven’t gotten into yet. Right now, I’m in seafood heaven… we have had halibut, calamari, and catfish. Throughout the trip it has just gotten more impressive! We’ve had stuffed chicken breasts, rack of lamb, filet mignon, lobster, a taco bar, the amberjack that Ryan caught, and pulled pork. Jessie is saving the menu’s for us so we can show them off when we get back. A few nights ago, Captain Jerry let Anne Marie and I drive the ship. 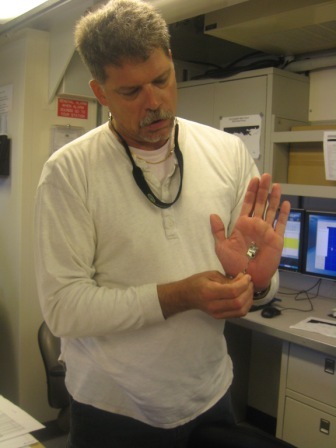 He explained that we were driving a 52 million dollar vessel with 30 lives on board, as if I wasn’t nervous already. We were moving to the next days work area so the bridge would be driving there all night. Anne Marie went first and I listened as Captain Jerry and Ensign Kelly Schill explained how to drive and the proper language. Everywhere you go on the ship there is certain etiquette for the way you talk and the way you dress. (No tank tops in the mess and closed toe shoes everywhere but your stateroom.) When you are steering you are following a set course with a gyroscopic compass as well as a digital heading reading, you are steering the rudder by degrees. You state the heading in single digits so 173 would be one seven three. We were driving in the dark so they had all the lights off and they even had red flashlights so they wouldn’t ruin their night vision. Anne Marie and I both got a chance to turn the ship in circles. Anne Marie even did a Williamson turn, which is done when there is a man overboard. You turn 60° to the left and then an equal amount to the other side so you are back on your course but turned around to pick up the person who is overboard. When she was doing this, the ETA to the next way point changed from 6:10 am to NEVER. We both laughed pretty hard! 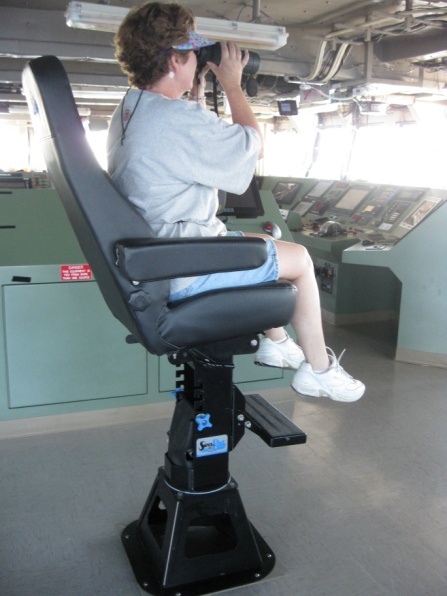 Dynamic Positioning system that is the automatic pilot is called Betty, she talks to the crew on the bridge and is extremely polite. The Captain promised to show us how to turn the DP on and off. Everything on the bridge is electronic. You can click a button and see how much fresh water is on board, how much fuel, which engines are working and even wake someone up! I’m consistently in awe of how much technology goes into running a ship of this magnitude. 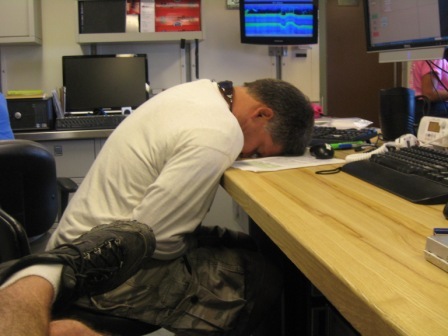 Tomorrow Chief Engineer Garett is giving us a tour of the engine room. In fact he told me he is going to make us espresso and then take us down! I’m really, really, having a great time! The water here is so blue! It’s a different shade of blue than the Pacific or Puget Sound. It’s bluer than green that’s the difference, there is no green. Even the seaweed isn’t green it’s a brownish yellow color, it’s called sargassum. The exchange intern Jose used a line and a hook to catch some so I could bring it back to show off. Looking over the side you often spot giant fish swimming along because the visibility is so high. This made me think of a lot of questions to ask Kevin tomorrow: Are there algae/plankton blooms in the Gulf? If so where do they happen? Does the temperature vary depending on the time of year or is it always warm? What do hurricanes do to the sea creatures? Have you noticed a rise or fall after a hurricane? Being on board a ship makes me feel like I’m 7 years old again and I don’t want to go to bed because I’m sure my parents are making me miss whatever fun thing they are doing at night. I don’t want to go to my stateroom, I wish I could be everywhere at once, on the bridge talking to the Captain and asking questions, listening to the stories of the crew, watching them fish, talking to the birders up on the flying deck, sitting in the lab and listening to the scientists joke or explain how to identify a fish or a coral or an algae. I wish I were able to be out here longer although, I have to say having a shorter cruise does make me appreciate every minute. 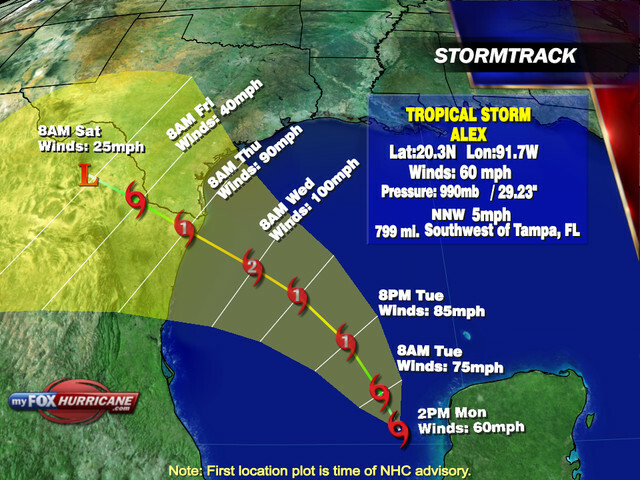 Tropical Storm Alex, which is a very strong tropical storm, has moved over the Yucatan Peninsula and continues to show signs of strengthening and organization. It was headed straight for us before we started steaming eastward to get out of its path. Our CO has monitored this progression carefully so he can make the decision to go into home port or not. Yesterday evening we started steaming east at 13 knots so we could be closer to Pascagoula if indeed he decided it was unsafe to stay at sea. When we woke this morning we found that Tropical Storm Alex had intensified overnight maintaining wind speed of 50-60 mph. An Air Force Reserve reconnaissance plane found that the atmospheric pressure was decreasing thus creating a very dangerous situation for the Pisces. The CO said that 12 foot waves crashing over the bow would not be fun so he made the decision to head back to Pascagoula today. We’ve been traveling at 14 knots all night long. Since that is as fast as we can go, we know that the CO is anxious to get us safely in port. He told us that he has to make a decision to return to home port early enough to get a berth at the dock. With all ships in the area heading to shore, he needs to make a decision within 72 hours of the storm hitting so we can get a berth. If you do not get back before the port closes, you have to ride out the storm on water. The swells have gotten much larger and deeper causing the ship to rock and roll. Walking down the halls is like being a ping pong ball bouncing everywhere. Taking a shower this morning and cleaning up was quite a challenge. When we came down to the lab, they were packing it in. The ship’s crew is busy cleaning the rooms, deck, and ladders (stairs). No more science. On our way back to Pascagoula, we passed within 6 miles of the Deepwater Horizon/BP disaster site. We saw 40 ships – pipeline boats, supply boats, a research vessel, tugs and barges that collect the oil, and the Stemstar, which is the ship that injects mud, steam, and concrete into damaged wells. On board the Stemstar are geologists and engineers who are working on solutions to stop the oil leakage of the well. 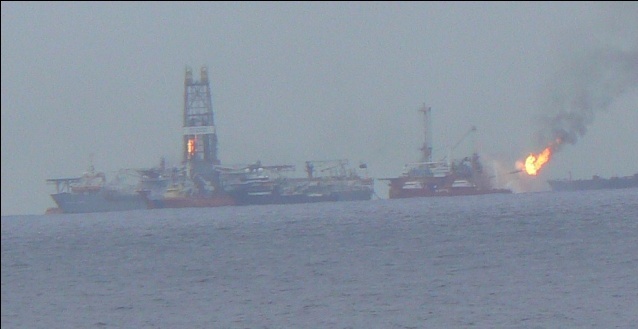 We also saw a fire boat sending water toward a flame that was burning off oil from a rig. The CO thought this might be to keep the heat from damaging the rigs and ships. When oil is burned off the surface of the water, oil crystallizes and hardens much like obsidian rock. It then sinks to the bottom of the ocean and is much easier to collect and dispose of. I am saddened that our cruise is over. I enjoyed the crew, scientists, and officers so much. They made our stay so enjoyable, but I am looking forward to bringing back to my students all that I’ve learned. As we watched Deepwater Horizon, I was stuck by the thought that you can’t connect the classroom to the real world better than this! To think that we were within 6 miles of Deepwater Horizon taking pictures to show my students, I thought, “We are watching one of the greatest disasters of our time.” It is incredibly sad to think how this oil is going to damage our pristine coast and affect so many lives. It is remarkable to think that I am one of the few people who get to see this up close and personal! On a happier note, not every student gets to say his/her teacher has piloted a 208-foot NOAA research vessel! 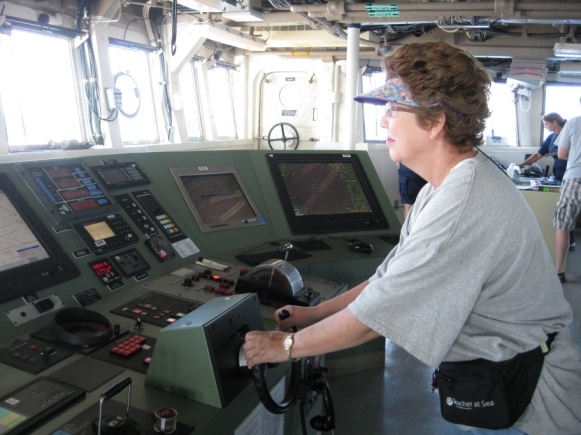 One night our Commanding Officer let me steer the ship – for REAL! I couldn’t believe the CO let me do that! He kept saying how easy it was to turn the ship. He said that the steering is very sensitive so if I made a sharp angled turn I could knock people right out of their berths, or beds! I sure didn’t want the crew mad at me so I wanted to be really careful. When he took the ship off automatic pilot and handed the ship off to me I was nervous as a tick, but I got the hang of it and really had fun. Nicolle, the other teacher, drove straight lines, and I steered in circles. She obviously was the better pilot! They printed off the “track line” so you can see my “donuts” in the sea! Pretty cool watching the bow of the ship swing right and then left. Although I enjoyed steering the ship, I was relieved to turn the helm back over to the CO.
It’s also very important to watch where you’re going. I was very surprised at how many obstacles there are out here – oil rigs, oil tankers, recreational boats, and the ever-present fish. So far, people on the bridge have sighted a dead whale, dolphins, and a sunfish. The CO told me that once he almost ran over a humpback whale. So you do have to watch where you’re going. Last night while we were in our rooms we heard, “Teachers at sea, report to the bridge. 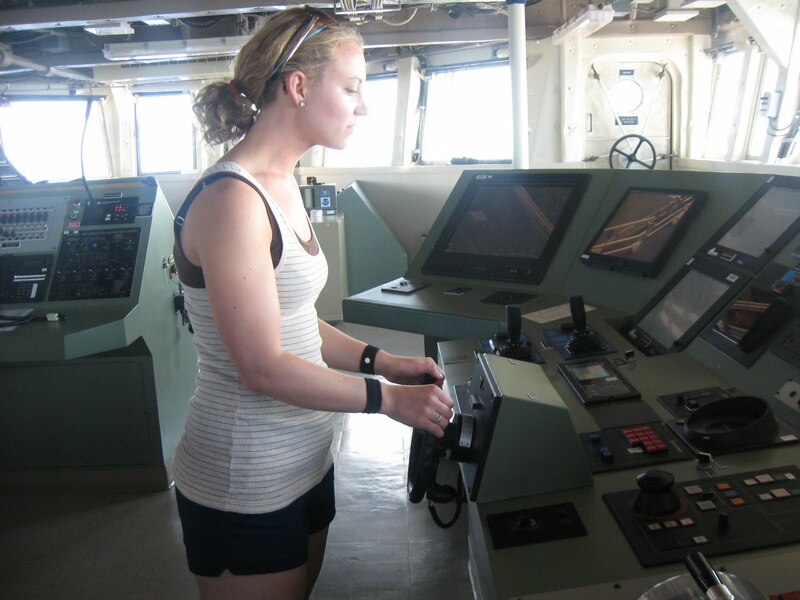 Teachers at sea, report to the bridge.” I felt like we were being sent to the Principal’s office! But it was a good thing. The XO had spotted dolphins and wanted us to see them. I’ve wanted to see a shark on board the whole trip, and when it happened, I was asleep! Nicolle was watching the deck hands fish off the stern when one of them caught, not one, but TWO sharks! 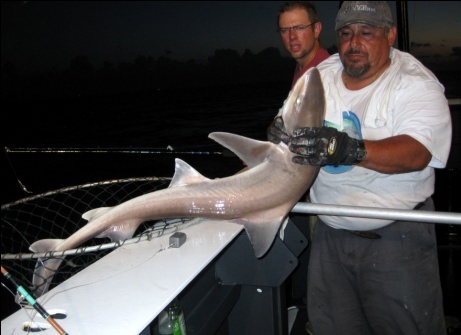 The sharks were both dogfish sharks and had to be brought aboard with a net. I was surprised to learn that dogfish sharks don’t have teeth. I thought all sharks had teeth, but that’s just an example of the types of things I’ve learned on this trip. Chris Gledhill, one of our scientists, told us that last night we would have a rare opportunity to view the Space Station as it passed overhead. So, at 9:00 pm I went to the bow and stared up at the sky. The stars were brilliant against the dark night sky and I had such a peace to come over me (even though at 14 knots the waves were splashing over the bow). Suddenly, I saw a light streaking across the sky! It was amazing! As it sped past, I thought of all the wonderful “firsts” that I’ve experienced while aboard the Pisces. It has been truly a remarkable trip. While on the bridge last night, I heard on the radio another ship broadcast they were “taking on water.” What would you do if you were on a boat in the Gulf and it suddenly started taking on water?